We live 100 meters from the city hall in Zizkov (Prague 3) and Tuesday was Masopust in Czech which means goodbye meat – they last day before lent. 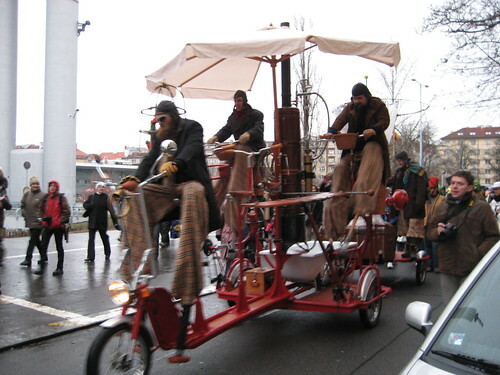 In Zizkov this is celebrated with people dressing up and walking in parade from Jiho z Podebrad to Zizkov city hall where the city provides free food and beer. So we had to check it out. Because of the cold weather (sigh!) we only stayed for one beer and by then we had seen a lot of the gimmicks. A funny thing was the odd mix of people withÂ old women, students, young school children, expats and tourists – everyone with a big smile on their face. Wednesday offered more entertainment in our neighborhood as Helge, a Danish friend, had invited us out to Akropolis. 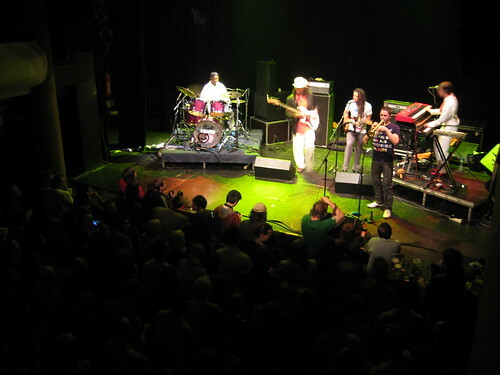 An Nigerian artist calledTony AllenÂ was playing afrobeat with his band. It turned out to be aÂ fantastic concertÂ andÂ AkropolisÂ has great atmosphere much in the same way as Vega in Copenhagen. After the concert we all went to a bar to celebrate Helges birthday, more people joined and the good times continued. We were about 8 or 10 Danish speaking people so it almost felt like being home.